In a large bowl or the bowl of a stand mixer, stir together 2 cups plus 2 tablespoons flour, sugar and yeast. Add in egg, butter (in small cubes), salt and buttermilk and mix on low speed until just combined. Divide dough into two pieces, one piece twice as large as the other. 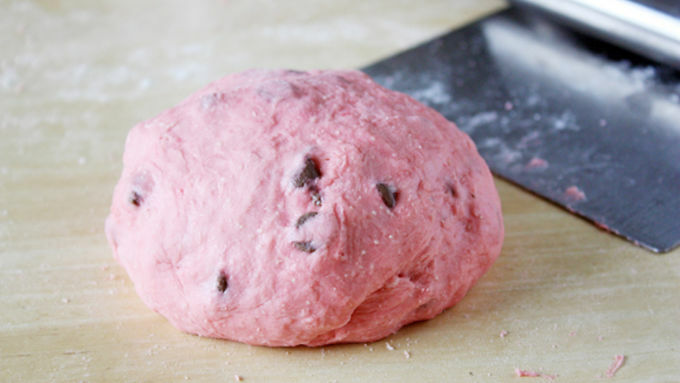 Into the larger piece of dough, stir chocolate chips and enough red coloring to dye dough to a deep pink color, adding up to 1/4 cup remaining flour as needed until dough is smooth and elastic and pulls away from sides of bowl, about 5 minutes. 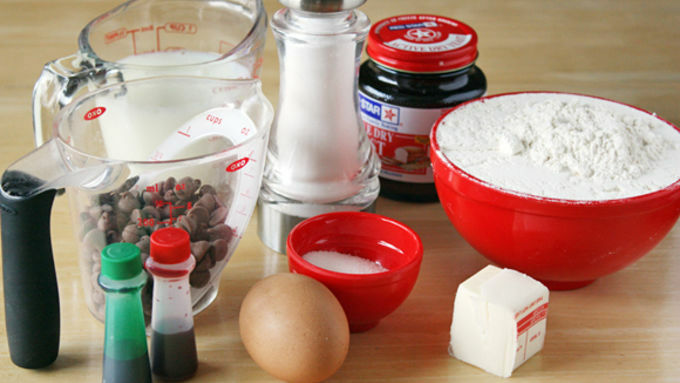 Remove red dough from bowl and place in another bowl. Cover and let rise until doubled, about 1 1/2 to 2 hours. 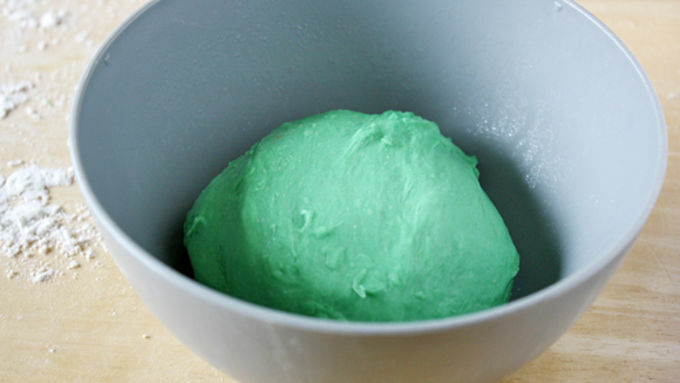 In a clean bowl, stir enough green food coloring to completely dye dough into smaller piece of dough, adding up to 1/4 cup remaining flour as needed until dough is smooth and elastic and pulls away from sides of bowl, about 5 minutes. Remove dough from bowl and place in another bowl. Cover and let rise until doubled, about 1 1/2 to 2 hours. Remove risen red dough from bowl and place on a lightly floured surface. Flatten, using fingers, into a rectangle about 6 by 8 inches. 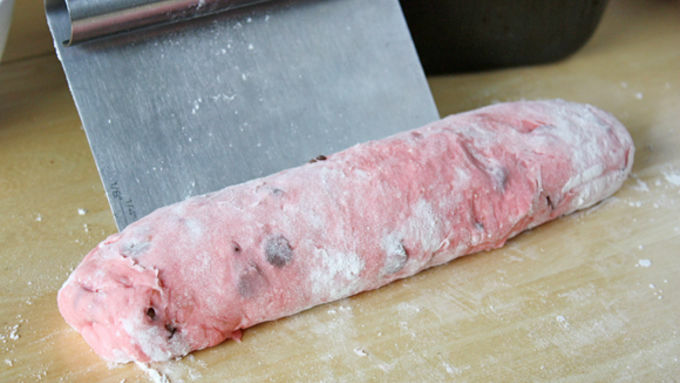 Roll the dough from the short end like a jelly roll, pinching the seam closed as you roll to tighten the top of the loaf. 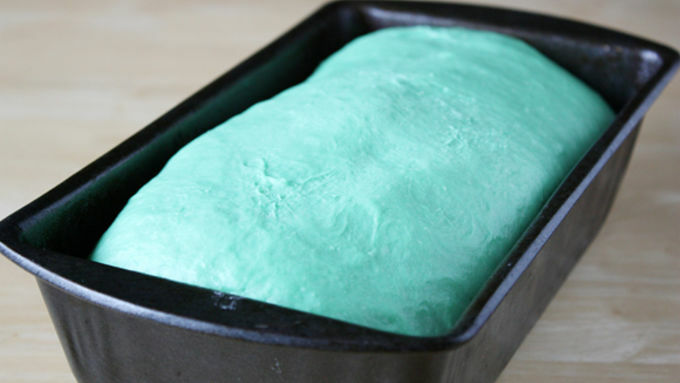 Remove risen green dough from bowl and flatten into a rectangle about 3 by 8 inches. 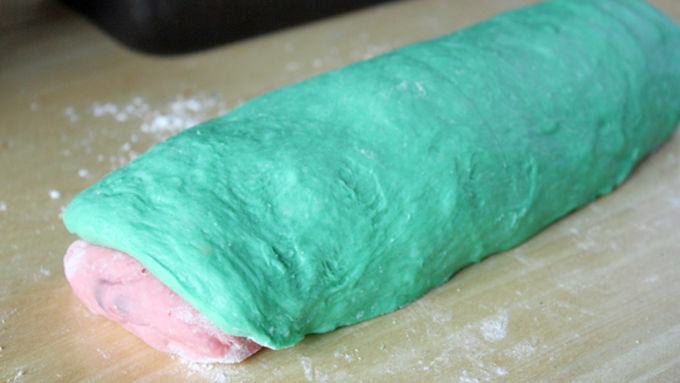 Carefully dome green dough over red dough, stretching as needed until long edges of green dough completely cover red dough. Carefully place loaf in a lightly greased 8 by 4-inch loaf pan. Cover and let rise until doubled, about 1 to 1 1/2 hours. Preheat oven to 350°F. Uncover risen loaf and bake 30-40 minutes, or until a golden brown. The dough should also register about 190°F inside and make a hollow thumping sound when thwacked on the bottom. Remove from loaf pan and allow to cool completely on a cooling rack before slicing. What if I told you it’s possible to have watermelon, PB & J sandwiches, French toast, even bread pudding all in ONE RECIPE? Believe it, folks. The revolution is here with this Watermelon-Shaped Chocolate Chip Bread. Dun dun dun… Before we go any further, let’s take a look at this recipe. Is it watermelon? Is it bread? It’s BOTH, people. 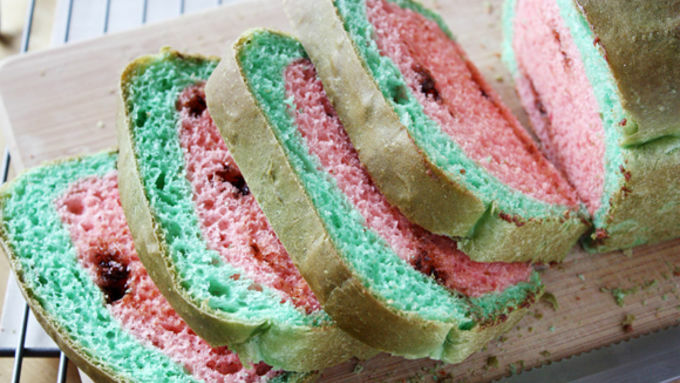 The magic of a little creativity and food coloring results in a chocolate chip-studded sandwich loaf that tastes like bread but looks like a watermelon. It’s madness! And it makes me feel like Willy Wonka. 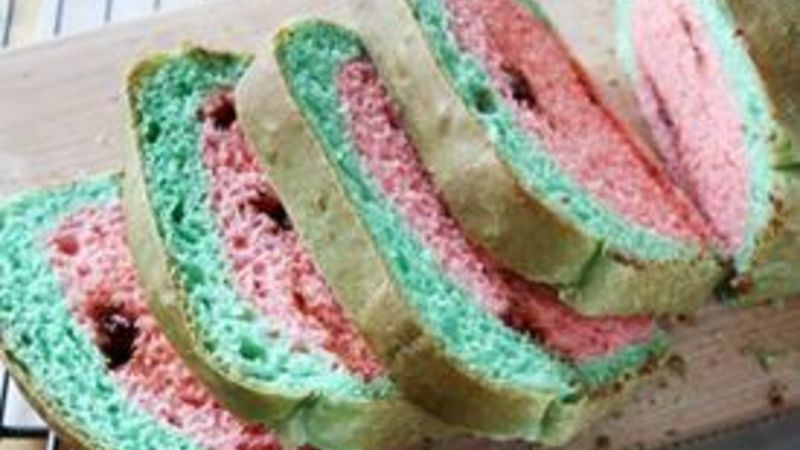 What is the most awesome of all the awesomeness in this recipe is that it’s super easy to make a sandwich loaf look like a slice of watermelon. And the result is a fun-to-look-at, yummy-to-eat bread that’s perfect for chocolatey peanut butter and jelly sandwiches, French toast, bread pudding: the list goes on. You can bring it to a picnic or pack it in kids’ lunches (OK, and your lunch, too) for a surprise treat. Here’s how to make the magic happen! Come with me, and you’ll be, in a world of pure imagination! Bake it up, let cool and slice to reveal the surprise! Willy Wonka would be proud.